Design the future of intelligent energy management! OGEMA (Open Gateway Energy MAnagement) is an open software platform that supports standardized building automation and energy management. The OGEMA platform can be applied in households, commercial environment and industries. OGEMA links the customer’s loads and generators to building automation and energy management applications. 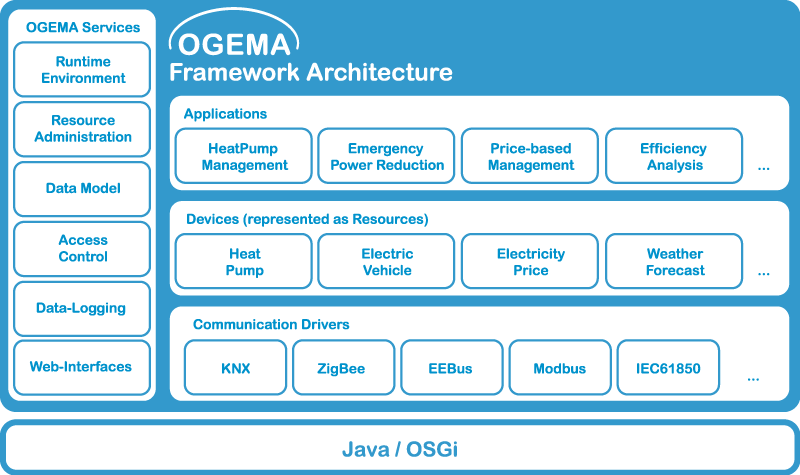 By providing a manufacturer- and hardware-independent platform, OGEMA allows energy flows within end customer premises to be optimized with high degree of modularity. Web-based user interaction and other basic functions are provided by a framework architecture shown in the illustration beside. To be able to execute software applications from various sources on a single embedded computer a common execution environment has to be defined to which all these applications are deployed. 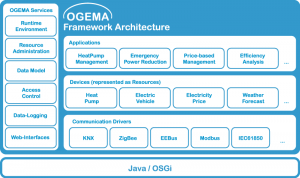 OGEMA uses Java and OSGi as widely accepted software standards that provide a cross-platform execution environment. OSGi provides the functionality to execute different applications in parallel. Both applications and communication drivers connect to data models that are defined by the OGEMA specification. These data models act as a Hardware Abstraction Layer allowing both applications and drivers to be developed against this common application interface (API). See the Specification overview document and the full API documentation for more information. New device types can be added to the framework dynamically by providing appropriate Java classes. Download the OGEMA 2.0 Demokit to run OGEMA and develop your own applications. The bundeled OGEMA-Launcher downloads all the necessary bundles. Instructions to start the system can be found in the OGEMA-Wiki. The OGEMA Software is open source and the Sources can be downloaded from GitHub. The sources are not required to run the Demokit. The OGEMA Alliance aims at developing a software standard and reference implementation. Participants are manufacturers and users/operators of standard conformant systems. All developers and involved parties can turn their ideas for more efficient energy usage by automation into software for the gateway platform. OGEMA is being developed in the Project “OGEMA 2.0″ by three leading Fraunhofer Institutes within the context of the German and European “Energiewende”. Fraunhofer IWES, Fraunhofer IIS and Fraunhofer ISE bring in their experiences from four major smart grid projects in the E-Energy framework in Germany. To accompany the project an Industrial Working Group (IWG) has been founded to bring in the industry’s practical experiences and to formulate individual requirements for the energy management gateway.